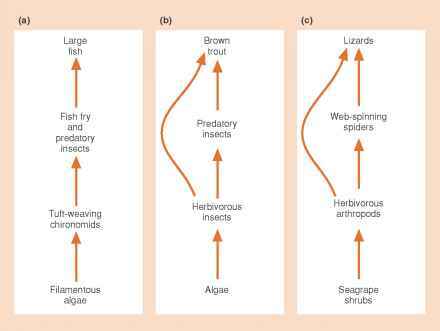 A food web is compartmentalized if it is organized into sub-units within which interactions are strong, but between which interactions are weak. (The most perfectly compartmentalized community possesses only linear food chains.) Do food webs tend to be compartmentalized? Not surprisingly, in studies where habitat divisions are major and unequivocal, there is a clear tendency for compartments to map onto habitats. For instance, Figure 20.18 shows the results of a classic study describing the major interactions within and between three interconnected habitats on Bear Island in the Arctic Ocean (Summerhayes & Elton, 1923). There is a significantly smaller number of interactions between habitats than would be expected by chance (Pimm & Lawton, 1980). On the other hand, when habitat divisions are subtler, the evidence for compartments is typically poor, and there are even greater difficulties in providing a clear demonstration of compartments (or the lack of them) within habitats. 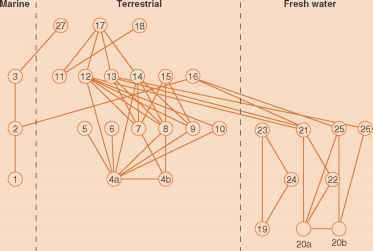 Early analyses, certainly, suggested that food webs within habitats are only as compartmentalized as would be expected by chance alone (Pimm & Lawton, 1980; Pimm, 1982). More recently, though, promising methodological advances have been made that seem capable of identifying compartments within larger webs, especially when the are the data simply not good enough? taxonomic resolution within the web is high and the strengths of interactions between the species can be weighted (Krause et al., 2002). Interestingly, the methods lean heavily on ideas from sociology, where the aim is to identify social cliques within a broader society. An example is shown in Figure 20.19. Also, an alternative perspective has been to emphasize that what have been described as distinct food webs in different habitats may often be linked by 'spatial subsidies' - crucial flows of energy and materials (Polis et al., 1997) - as, for example, when lake fish that normally prey upon other fish in the pelagic (open water) food web, switch to quite different prey in the benthic food web when their preferred prey are scarce (Schindler & Scheuerell, 2002). That is, what might seem to be separate webs are in fact compartments within a larger web. Since no clear consensus has emerged that food webs are more compartmentalized than would be expected by chance alone, it would be inappropriate to argue that compartmentalization has been 'favored' because compartmentalized webs persist. None the less, since the earliest theoretical studies (e.g. May, 1972), a consensus has emerged that communities will have increased stability if they are compartmentalized, and it is easy to see why this might be so. In the first place, a disturbance to a compartmentalized web tends to be contained within the disturbed compartment, limiting the overall extent of the effects in the wider web. In addition, though, spatial subsidies between compartments will tend to buffer individual compartments against the worst excesses of disturbances within them. For instance, in the example above, piscivorous fish, when their preferred prey are rare, may switch to the benthos rather than driving populations of those preferred prey to extinction. The apparent contradiction between these two justifications of the stabilizing properties of compart-mentalization can be resolved if we emphasize the first where a seemingly unified web is in fact a series of semidetached compartments, and emphasize the second where seemingly separate webs are in fact coupled. Thus, it may be that an intermediate degree of compartmentalization is the most stable. This chapter closes, then, with a tone that has pervaded much of it: suggestive but uncertain. Further progress, though, is essential. One standard answer of ecologists to the layman's question 'What does it matter if we lose that species?' is, quite rightly, 'But you must also consider the wider effects of that loss; losing that species may affect the whole food web of which it is part'. The need for further understanding of those wider effects is intense.